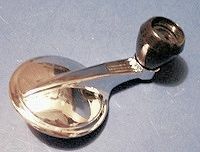 This inside vent window crank is chrome with a black knob, is used on all 1953-1957 Chevy Cars. Used on the 2dr, 4dr, Sport Coupe, Wagon, Conv. and Sedan Delivery. Please notice that the vent window crank is shorter than the window crank. Nice chrome with black knobs and the black knob has a stainless insert and comes with the horseshoe shaped clip that holds them onto the spline. For information sake, the 1953 – 1957 Chevy vent window cranks are the same. They are also the same as the 1951-1952 vent window cranks except for the color of the knob. The knob on the 1951-1952 Chevy is Ivory. My point is, you could use either one to compliment the color of your interior. Also for information sake, the window cranks mount on a spline shaft which is part of the “window regulator”. In the case of the door handle, the spline it fastens onto is part of the “remote”. Again for information sake, the spline used 1939 to 1957 is larger than the spline used on the 1937 and earlier Chevy’s.